Thursday Aug. 25 will go down in Los Angeles Dodgers history as one of the franchise’s strangest recent regular-season days. It started with the sport’s best pitcher, Clayton Kershaw, crying in the dugout with A.J. Ellis, his teammate and favorite catcher, upon learning the news that Ellis had been traded to the Phillies. Why the Dodgers chose to not more personally and directly alert Kershaw, we’ll never understand. 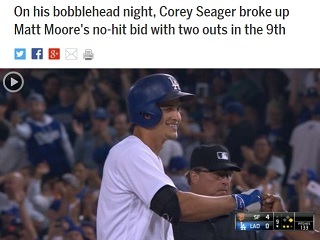 Then, with two outs in the ninth inning of that night’s game against arch-rivals the Giants, Dodgers shortsop Corey Seager, on his bobblehead night, broke up a no-hitter about to be notched by Matt Moore. There’s (usually) no crying in baseball, but Moore would have been entirely forgiven if he had also shed tears. The headlines today are pretty circumspect, from MLB.com to The Huffington Post. In fact, the better ones, per the sample below, are being etched on social media.